Miso is perhaps one of the most well-known Japanese ingredients (except for soy-sauce) with its most popular use of Miso soup; but it’s a fantastic ingredient with a versatility far beyond soups. Miso itself is a paste-like substance made from fermented soybeans mixed with other grains such as rice, wheat and barley; with a rich savoury flavour giving an instant umami depth. Colour is generally a good indicator of the flavour and strength of a miso with the darker the colour the longer it’s been aged and the greater the depth of flavour. White miso or Shiro miso is actually a pale golden colour made with soy beans and rice. With its mild flavour due to its short fermentation time, it’s perfect for recipes where you don’t want the flavour to be overpowering. The Sanchi Shiro Miso is aged for only a few weeks and has less salt and a sweeter flavour than other varieties of miso. 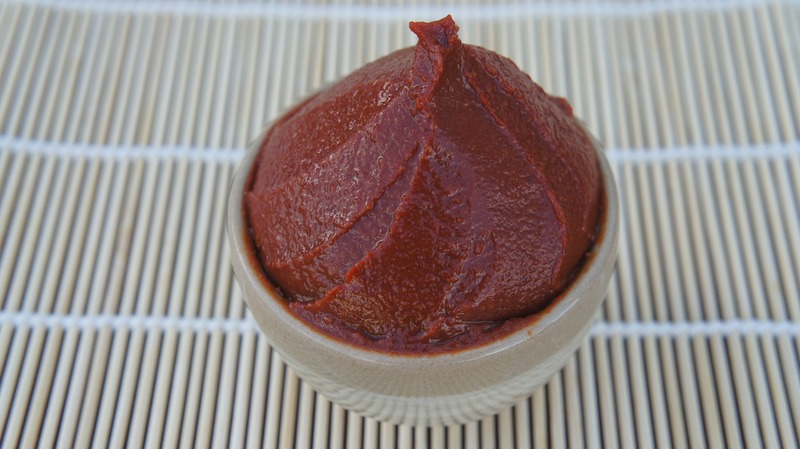 Red Miso (aka miso, and the most common form of miso found) is made from fermented soy beans and another grain – usually barley or rice; when it’s made with just barley (no rice) it’s often referred to as Mugi Miso. Aged for a longer time than the white miso usually up to a year or longer, it has a terracotta colour and is good for marinades and glazes. Try the Sanchi Mugi Miso or Sanchi Genmai Miso (made from just rice) for a saltier, stronger more intense flavour. Hatcho Miso is made just from soybeans and with its long fermentation time (2-3 years) is a dark (almost black) colour and a firm/sticky paste. This long fermentation time gives it the most pungent flavour making it good for robust stews, marinades and sauces. So pick a miso and add it to marinades, sauces, vegetables and bakes for an injection of salty, umami flavour! For some ideas on how to get started with miso for every day cooking visit our recipes page.